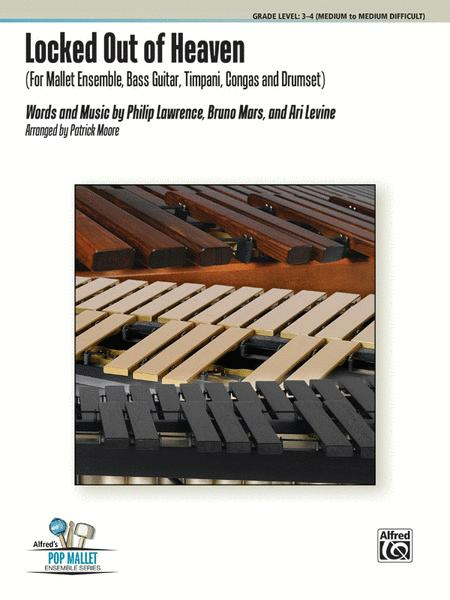 For Mallet Ensemble, Bass Guitar, Timpani, Congas, and Drumset. Composed by Philip Lawrence, Bruno Mars, and Ari Levine. Arranged by Patrick Moore. 5 or More; Percussion - Ensemble; Solo Small Ensembles. Alfred's Pop Mallet Ensemble Series. Funk. 36 pages. Alfred Music #00-42668. Published by Alfred Music (AP.42668). Locked Out of Heaven is the lead single off Unorthodox Jukebox (2012), the second studio album from American singer/songwriter Bruno Mars. A new wave, funk, and reggae rock song about the rapturous feelings brought about by a relationship infused with positive emotions, it was a huge commercial success quickly after its release on October 1, 2012. The song topped the Billboard Hot 100 for six consecutive weeks and the Canadian Hot 100 for three consecutive weeks, while also charting inside the Top 10 in 20 countries.